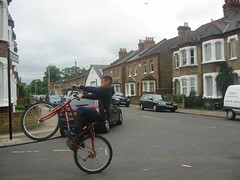 I've just discovered that this is what my step-son does with my very well looked after and expensive mountian bike when I am at work. Well, I've been reading and participating in a few political discussions over at several groups I belong to at Flickr. I certainly don't wish to create yet another heated debate here BUT - was it entirely neccessary to pump five bullets at close range into the head of a man who as it turns out was innocent? I'm surprised that most people I know think 'yes' it was. Personally, I'm not so sure. I am also ashamed to admit that I have had my random moments of fear and un-founded suspicion. Like a week a go I saw a man with a new black rucksack waiting to get on my train - I chose not to get on the train as I judged him and judged him wrongly. I felt incredibly stupid for doing that. Last Thursday I had a second of heart-stopping panic as again, in a packed train I saw a man fiddling with a black wire. He was de-tangling a mobile phone charger cable which was not attached to anything at either end - but I had to check first. Apparently, the Brazilian man that was shot dead by the police at Stockwell had changed his normal route to work as he was afraid of further terrorist attacks. How ironic is that? A friend I was talking to about it reminded me that we are 'at war' (well, no we are not officially but I see what he means) and in war innocent people get killed. I'm not so sure I agree with that but I know there are alot of people that would. Personally, I think the police over-reacted at Stockwell. Seeing as they had caught up with their suspect and had over-powered him enough to pump five bullets into his head, it surely wouldn't have taken a second more to immobilise him safely, search and take him away to investigate further? The 'wires' that were seen coming out of his coat were probably nothing more than headphones but my point is that sometimes people see what they want to see - re: my phone charger wire above. It takes less than a second to check. I know, I know - his big maistake was to run away when cautioned to stop but there must have been other reasons for that - and why we'll probably never know. Sad and occasionally depressing that we have to live in such increasingly Orwellian times. I'm constantly amazed at what people search for and how such weird requests seem to direct them to my blog. Someone yesterday searched for "depressed on your birthday". Well, if that isn't depressing enough in itself - really! I probably wasn't of much help as my entry was all about the fact that my birthday January 24th has been mathematically proven to be the most depressing day of the year. Hopefully it cheered them up a bit. Mr Andino: Hey, there's this broad in England that's making me lose business Paulie. You gotta help me out here. Paulie: Don't worry Mr Andino, consider it done. Tony has some cousins who are looking into it right now. Let's say it's gonna be business as usual from Saturday and the broad's goin' on a looong holiday somewhere very cold. Mr Andino (a little heated): Well you do that Paulie I'm bustin' my balls here. Pause. Which Tony? Tony the Greek? Little Tony? Paulie: No New Tony. Two Tone. Mr Andino: Two Tone? Which Tony is that? (Exasperated in a Joe Pesci type of way) Christ why are there so many Tony's these days Paulie? Paulie: We call him Two Tone because he's schizo - you know....when he was in prison the doctor said he had two sides to his personality so we called him Two Tone. Mr Andino: Whatever, whatever. Just get my restaurant packed out by Saturday. Do what you have to do! OK - I've got a bit carried away but you were hooked all the same! But seriously, if you are ever in Providence Rhode Island go to Andino's - it's great! And I didn't really slag it off I just complained about how horrible American meat is in general. Andino's was fabulous - great atmosphere, great Sinatra, the best Italian wine I've ever had and Mr Andino's signature sauce is to die for - pardon the pun. If you are lucky - he makes an appearance at the bar most nights which is quite exciting. Well, I was excited but I did have jet lag at the time. Started my new job on Tuesday and got the early off yesterday which was nice! I went to see Dig! - a film that I've been wanting to see for ages. It was rather long - but seeing as it documents seven years of band hell (mainly) it was utterly compulsive viewing. 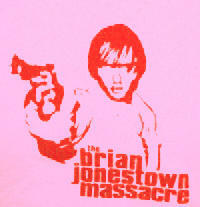 It is about 2 then un-signed bands - The Dandy Warhols and The Brian Jonestown Massacre. It charts the rise and rise of the Dandy's and the spectacular near success and terrible fall of T B Jonestown Massacre. It's actually really tragic in parts and I personally think TBJM were/are a better band. Due to lead singer Anton Letcombe's tortured genius unpredictability the whole thing caved in rather drastically. It's worth going to see. Looks llike TBJM are now back on track although with a different line-up from the original. They are currently on a tour of UK and US. Well, apparently yesterday has been tagged with the title 7/7. For some reason I find that quite irritating. I suppose it makes it easier for the Americans to refer to seeing as they do dates the other way round from us. I wasn't going to go into London today but had to at the last minute. Needless to say I drove and parked only to be finally fleeced to the tune of £34 for the pleasure of my battered, sloping Saab laying idle for 6 hours in an NCP. Thank you Visa! I knew going on the train would be fine but I really didn't fancy that feeling of foreboding as I transferred from overland train into the dark and highly policed abyss of Vauxhall or Waterloo tube stations. I'm not a particularly panicky person but I did feel nervy today - especially for some reason when I had to walk (run) past big rubbish bins on Oxford Street - my overactive imagination running riot and my heart pounding. Crazy - but it is a genuine fear. I could see people on buses and wondered if those who had sat on the top had thought about it or just done it out of habit. The police were everywhere. There was also an airborne sense of solidarity and defiance which actually made me feel a bit calmer. By early afternoon there was almost a hustle and a bustle back into Soho with many smiling and laughing in the sun. Goodness, both I and all of them are the lucky ones. My heart goes out to all those who never made it home and to those especially that they have had to leave behind. I think the emergency medical services did an amazing job. I don't like the world we live in right now. 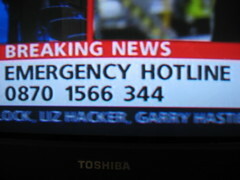 This is the emergency number for casualty checks. Words fail me. 1000+ casualties and 45 (and counting) fatalities. The final figure will be much worse. Please call this number if you are worried about your relatives or loved ones whereabouts. Good luck to those injured or looking for people. Please think of those left in shock and grieving for their lost ones and feel ever grateful for those treating and experiencing these terrible scenes first-hand. This is madness and can not have been inflicted in the quest for peace - just evil. Those responsible are not worthy of any god. Right - enough of Live8. 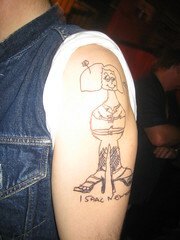 This is a picture of our friend Dan's new tattoo. I know. I've never laughed so hard in all my life. Quality. I saw this today - it was part of a series of home made signs that had been put up around my local area - mainly around the local church and convent. I like the fact that someone had bothered to take the effort to do it. 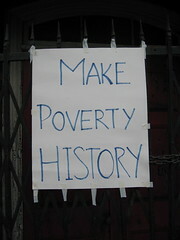 It's a good thing that people feel they can make a difference even if it is with a home made sign. No one can ignore the efforts that ordinary people are making to try and help others more unfortunate than ourselves and also beholden to ourselves in so many ways. Think of this when you are at your summit next week - and best of luck – we are counting on you Tony. You currently have the potential to be one of the most influential world leader’s in modern history - only you can make the final difference and persuade the other seven to put their pens to that paper and stop poverty now! By the time this message has been sent to you and in the short time it has taken me to write it at least 114 people (mostly children) in Africa will have died needlessly. If it was this country - that wouldn't happen and you know it. Some people probably think I'm really stupid but I don't care! Come on - here's the link - put your photo up on the gallery or send a letter to Tony Blair or text or blog or just do something. We all can do this. Click here.